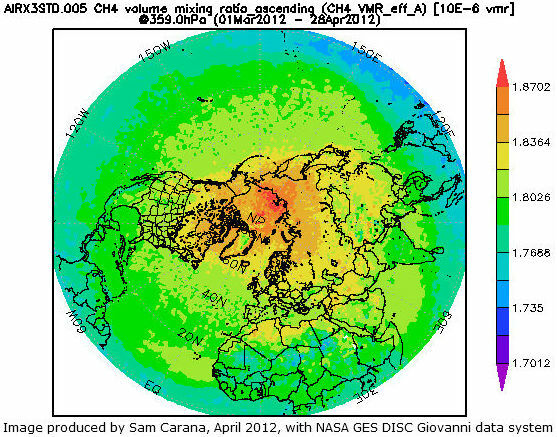 Methane levels have been high above the East Siberian Arctic Shelf for both the months March and April 2012, as illustrated by the image below. I am writing in response to information provided recently by Professor Julia Slingo OBE, Chief Scientist, Meteorological Office, firstly in the report 'Possibility and Impact of Rapid Climate Change in the Arctic' to the Environmental Audit Committee and subsequently in answering questions from the Committee on Wednesday 14 March 2012. In the responses, the Meteorological Office refers to an earlier presentation to the Committee by myself, made on 21 February 2012. The data that Prof. Slingo rejected are part of PIOMAS, which is held in high regard, not only by me, but also by many experts in the field. From my position of somebody who has studied the Arctic for many years and has been actively participating in submarine measurements of the Arctic ice thickness since 1976, it seems extraordinary to me that for Prof. Slingo can effectively rule out these PIOMAS data in her consideration of the evidence for decreasing ice volume, when one considers the vast effort and diligence that has been invested over such an extended period in collecting data under the ice by both British and US scientists. Prof. Slingo offers no reason whatsoever for dismissing this extremely pertinent set of measurements and their associated interpretation, arguing that "the observational estimates are still very uncertain". This is not the case. I expand on this in an Appendix to my letter. It has to be said that it is very poor scientific practice to reject in such a cavalier fashion any source of data that has been gathered according to accepted high scientific standards and published in numerous papers in high-profile journals such as Nature and Journal of Geophysical Research, the more so when the sole reason for this rejection appears to be perceived uncertainty. If other data are in conflict with one’s own data, then caution should be given to the validity of one’s own data, while this should immediately set in train further research and measurement in efforts to resolve possible conflicts. In this case, however, the crucial point is that there is currently no rival set of data to compare with the scale and comprehensiveness of the PIOMAS data; Prof. Slingo sets against the clear observational database only the Met. Office’s models. These models (and in fact all the models used by IPCC) have already shown themselves to be inadequate in that they failed to predict the rapid decline in sea ice area which has occurred in recent years. It is absurd in such a case to prefer the predictions of failed models to an obvious near-term extrapolation based on observed and measured trends. Regarding the possibility of an imminent collapse of sea ice, Prof. Slingo ignores a point raised earlier by herself, i.e. that, apart from melting, strong winds can also influence sea ice extent, as happened in 2007 when much ice was driven across the Arctic Ocean by southerly winds (not northerly, as she stated). The fact that this occurred can only lead us to conclude that this could happen again. Natural variability offers no reason to rule out such a collapse, since natural variability works both ways, it could bring about such a collapse either earlier or later than models indicate. In fact, the thinner the sea ice gets, the more likely an early collapse is to occur. It is accepted science that global warming will increase the intensity of extreme weather events, so more heavy winds and more intense storms can be expected to increasingly break up the remaining ice, both mechanically and by enhancing ocean heat transfer to the under-ice surface. 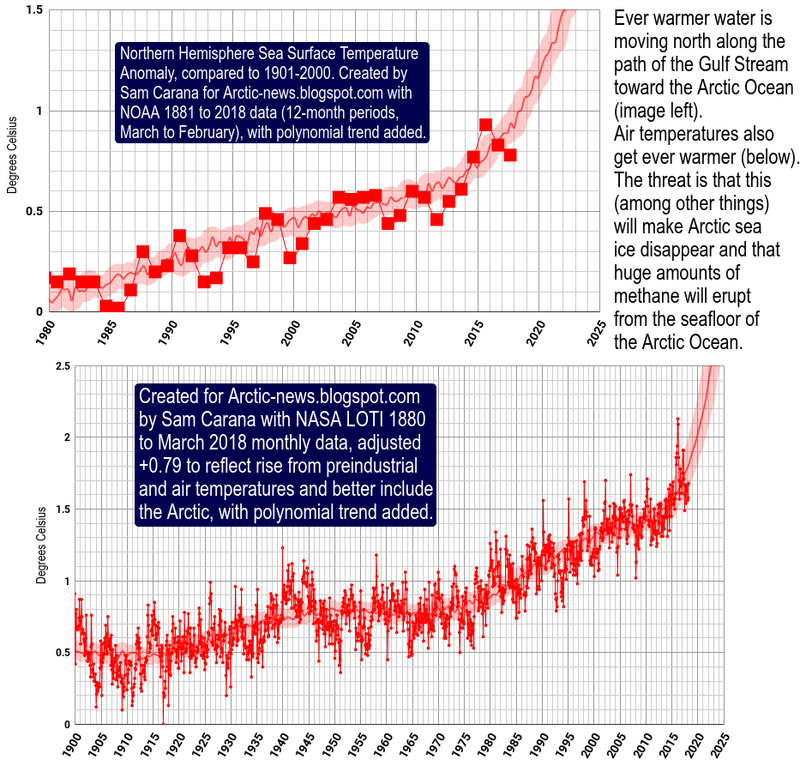 The concluding observation I have to make on this first point is that Prof. Slingo has not provided any justification for ignoring the measurements that we have of ice volume changes and the clear trend towards imminent ice-free summers that they indicate. The East Siberian Arctic Shelf (ESAS), where the intensive seabed methane emissions have been recorded, is only about 50 m deep. Throughout the world ocean, the Mixed Layer (the near-surface layer where wind-induced mixing of water occurs) is typically 100-200 m deep. It is shallower only in areas where the water is extremely calm. This used to be the case for the Arctic Ocean because of its ice cover, but it is no longer the case, because of the large-scale summer sea ice retreat which has created a wide-open Beaufort Sea where storms can create waves as high as in any other ocean, which exert their full mixing effect on the waters. It is certain that a 50 m deep open shelf sea is mixed to the bottom, so I am at a loss to understand Prof. Slingo’s remarks, unless she is thinking of the deep ocean or deeper shelves elsewhere than the East Siberian Sea. Furthermore, Prof. Slingo states that "where there is methane coming out of the continental shelf there it is not reaching the surface either, because again the methane is oxidised during its passage through the sea water and none of those plumes made it to the surface. So there is a general consensus that only a small fraction of methane, when it is released through this gradual process of warming of the continental shelf, actually reaches the surface." This statement is also incomprehensible as far as the East Siberian Arctic Shelf is concerned. With such a shallow water depth the methane plume reaches the surface within a few seconds of release, giving little opportunity for oxidation on the way up. She may be confusing this situation with that of the much deeper waters off Svalbard where methane plumes are indeed observed to peter out before reaching the surface, due to oxidation within the water column. To illustrate the reality of this warming of ESAS shelf water, I reproduce (fig. 1) a satellite sea surface temperature data (SST) map from September 2011, provided by Dr James Overland of Pacific Marine Environmental Laboratory (PMEL), Seattle. This shows that in summer 2011 the surface water temperature in the open part of the Beaufort and Chukchi seas reached a massive 6-7°C over most of the region and up to 9°C along the Arctic coast of Alaska. This is warmer than the temperature of the North Sea at Scarborough yesterday. This extraordinary warming is due to absorption of solar radiation by the open water. These are not the temperatures of a very thin skin as suggested by Prof. Slingo. The NOAA data apply to the uppermost 7 m of the ocean, while PMEL has backup data from Wave Gliders (automatic vehicles that run oceanographic surveys at preprogrammed depths) to show that this warming extends to at least 20 m. We can conclude from fig.1 that an extraordinary seabed warming is taking place, certainly sufficient to cause rapid melt of offshore permafrost, and this must cause serious concern with respect to the danger of a large methane outbreak. Once the methane reaches the surface, one should note that there is very little hydroxyl in the Arctic atmosphere to break down the methane, a situation that again becomes even worse with large releases of methane. 3. The choice of pursuing geo-engineering or not. Finally, I would like to address Prof. Slingo’s closing remarks on geo-engineering. Prof. Salter responds: "I must disagree. You have to continue only until emissions have fallen sufficiently or CO2 removal methods have proved effective or there is a collective world view that abrupt global warming is a good thing after all. No action by the geo-engineering community is impeding these. Indeed everyone working in the field hopes that geoengineering will never be needed but fears that it might be needed with the greatest urgency. This is like the view of people who hope and pray that houses will not catch fire and cars will not crash but still want emergency services to be well trained and well equipped with ambulances and fires engines." Basically he is talking about the precautionary principle. I fully agree with Prof. Salter on this point, and I also fully share with Prof. Salter the anxieties of the Arctic Methane Emergency Group. A highly proactive geo-engineering research programme aimed at mitigating global warming is more rational than expecting the worst but not taking any action to avert it. Member of Arctic Methane Emergency Group; Review Editor for Intergovernmental Panel on Climate Change 5th Assessment (chapter 1). FIG.1. September 12-13 2011. 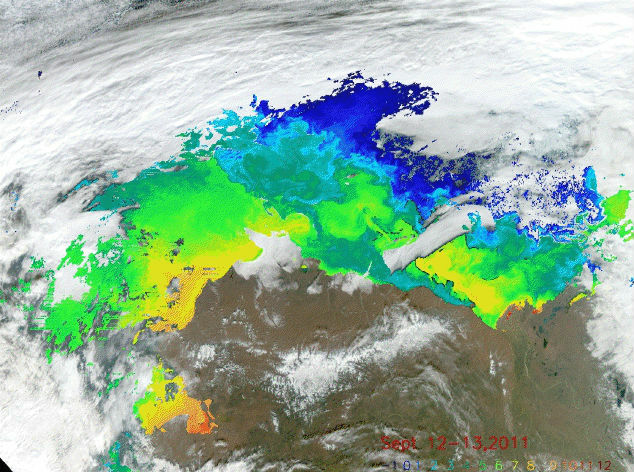 NOAA-6 and-7 imagery of sea surface temperature in Beaufort Sea (courtesy of J. Overland). Alaska is brown land mass in bottom half. Note 6-7°C temperatures (green) in west, over East Siberian Shelf, and up to 9°C (orange) along Alaskan coast. Appendix. 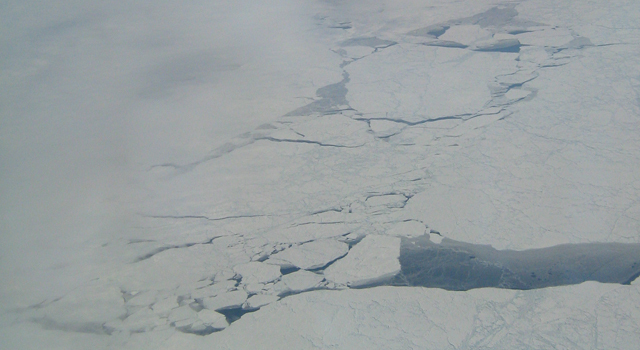 The scientific database for sea ice loss. On a previous occasion (21 February) I testified to the Committee and showed them the results of submarine measurements of ic thickness combined with satellite observations of ice retreat. When these two datasets are combined , they demonstrate beyond doubt that the volume of sea ice in the Arctic has seriously diminished over the past 40 years, by about 75% in the case of the late summer volume. If this decline is extrapolated, then without the need for models (which have demonstrably failed to predict the rapid retreat of sea ice in the last few years) it can be easily seen that the summer sea ice will disappear by about 2016 (plus or minus about 3 years). It might be useful to summarise the history of research in this subject. In her testimony Prof Slingo placed her faith in model predictions and in future data to come from satellites on thickness (presumably Cryosat-2, which has not yet produced any usable data on ice thickness). Yet since the 1950s US and British submarines have been regularly sailing to the Arctic (I have been doing it since 1976) and accurately measuring ice thickness in transects across that ocean. 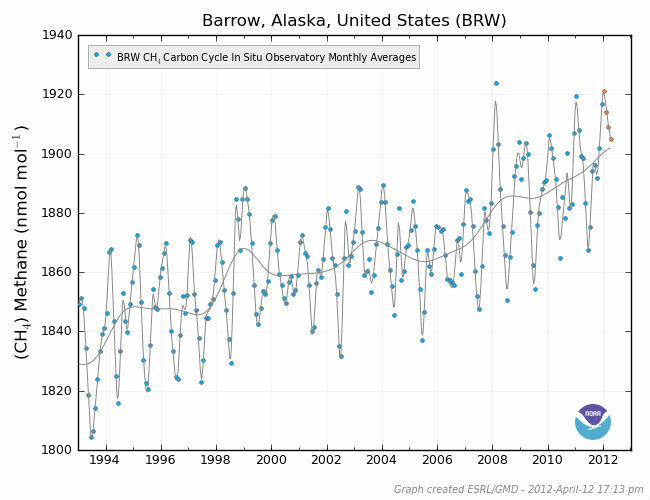 Her statement that "we do not know the ice thickness in the Arctic" is false. In 1990 I published the first evidence of ice thinning in the Arctic in Nature (Wadhams, 1990). At that stage it was a 15% thinning over the Eurasian Basin. Incorporating later data my group was able to demonstrate a 43% thinning by the late 1990s (Wadhams and Davis, 2000, 2001), and this was in exact agreement with observations made by Dr Drew Rothrock of the University of Washington, who has had the main responsibility for analyzing data from US submarines (Rothrock et al., 1999, 2003; Kwok and Rothrock, 2009) and who examined all the other sectors of the Arctic Ocean. In fact in his 2003 paper Rothrock showed that in every sector of the Arctic Ocean a substantial hickness loss had occurred in the preceding 20 years. Further thinning has since been demonstrated, e.g. see my latest paper on this (Wadhams et al., 2011). Among the foremost US researchers at present active on sea ice volume decline are Dr Ron Kwok of the NASA Jet Propulsion Laboratory and Dr Axel Schweiger of University of Washington (leader of the PIOMAS project), and these have both been moved to write to Prof Slingo expressing their surprise at her remarks deriding the scientific database. Even if we only consider a 43% loss of mean thickness (which was documented as occurring up to 1999), the accompanying loss of area (30-40%) gives a volume loss of some 75%. Summer melt measurements made in 2007 in the Beaufort Sea by Perovich et al. (2008) showed 2 m of bottom melt. If these enhanced melt rates are applied to ice which is mainly first-year and which has itself suffered thinning through global warming, then it is clear that very soon we will be facing a collapse of the ice cover through summer melt being greater than winter growth. 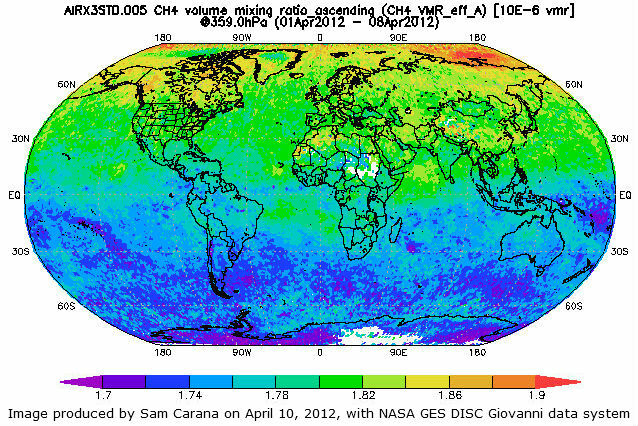 These observations do not just come from me but also from the PIOMAS project at the University of Washington (a programme to map volume change of sea ice led by Dr Rothrock himself and Dr Schweiger), the satellite-based work of Ron Kwok, and the high-resolution modelling work of Dr Wieslaw Maslowsky at the Naval Postgraduate School, Monterey (e.g. Maslowsky et al 2011). Kwok, R., and D. A. Rothrock ( 2009 ), Decline in Arctic sea ice thickness from submarine and ICESat records: 1958- 2008,Geophys. Res. Lett ., 36, L15501. Perovich, D.K., J.A. Richter-Menge, K.F. Jones, and B. Light (2008). Sunlight, water, ice: Extreme Arctic sea ice melt during the summer of 2007. Geophysical Research Letters 35: L11501. doi: 10.1029/2008GL034007 . Rothrock, D.A., Y. Yu, and G.A. Maykut. (1999). Thinning of the Arctic sea-ice cover . Geophysical Research Letters 26: 3469–3472. Rothrock, D.A., J. Zhang, and Y. Yu. (2003). The arctic ice thickness anomaly of the 1990s: A consistent view from observations and models. Journal of Geophysical Research 108: 3083. doi: 10.1029/2001JC001208 . Kort, a JPL postdoctoral scholar affiliated with the Keck Institute of Space Studies at the California Institute of Technology in Pasadena, led the analysis while he was a student at Harvard University, Cambridge, Mass. 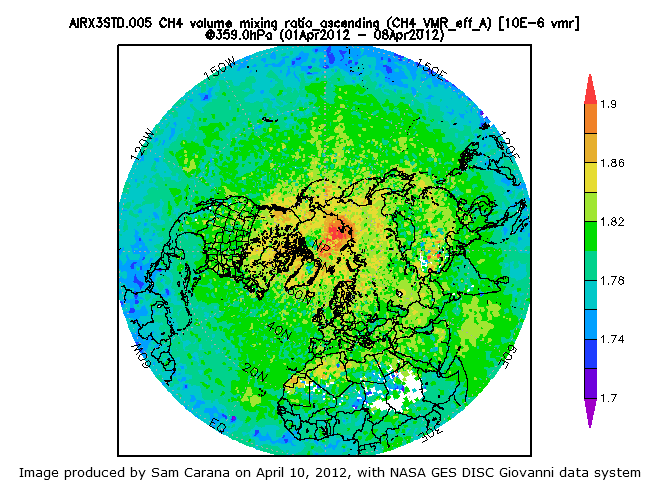 The study was conducted as part of the HIAPER Pole-to-Pole Observations (HIPPO) airborne campaign, which flew a specially instrumented National Science Foundation (NSF)/National Center for Atmospheric Research (NCAR) Gulfstream V aircraft over the Pacific Ocean from nearly pole to pole, collecting atmospheric measurements from Earth's surface to an altitude of 8.7 miles (14 kilometers). The campaign, primarily funded by NSF with additional funding from NCAR, NASA and the National Oceanic and Atmospheric Administration, was designed to improve our understanding of where greenhouse gases are originating and being stored in the Earth system. During five HIPPO flights over the Arctic from 2009 to 2010, Kort's team observed increased methane levels while flying at low altitudes over the remote Arctic Ocean, north of the Chukchi and Beaufort Seas. The methane level was about one-half percent larger than normal background levels. So how is the methane being produced? The scientists aren't yet sure, but Kort hinted biological production from living things in Arctic surface waters may be a likely culprit. "It's possible that as large areas of sea ice melt and expose more ocean water, methane production may increase, leading to larger methane emissions," he said. He said future studies will be needed to understand the enhanced methane levels and associated emission processes and to measure their total contribution to overall Arctic methane levels. "While the methane levels we detected weren't particularly large, the potential source region, the Arctic Ocean, is vast, so our finding could represent a noticeable new global source of methane," he added. "As Arctic sea ice cover continues to decline in a warming climate, this source of methane may well increase. It's important that we recognize the potential contribution from this source of methane to avoid falsely interpreting any changes observed in Arctic methane levels in the future." 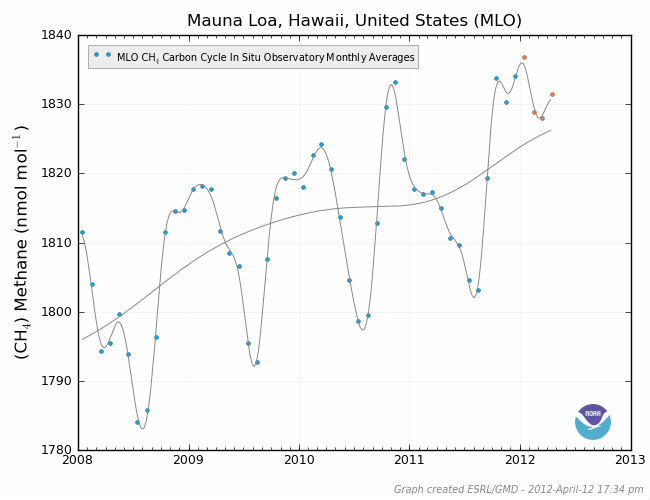 The study, published April 22 in Nature Geoscience, included participation from JPL and Caltech; NSF, Arlington, Va.; NOAA's Earth System Research Laboratory, Boulder, Colo.; the University of Colorado's Cooperative Institute for Research in Environmental Sciences, Boulder; Harvard University, Cambridge, Mass. ; Princeton University, Princeton, New Jersey; Universidad Nacional de Colombia, Bogota, Colombia; and Science and Technology Corporation, Boulder, Colo. JPL is a division of Caltech. There has been some discussion recently about extrapolating Arctic sea ice data, particularly for data relating to annual minimum sea ice. I've been trying which kind of trendline fits best and my conclusion is that a trendline pointing at 2014 fits the data best (image left). The respective dataset, on the left underneath, was produced by the Pan-Arctic Ice Ocean Modeling and Assimilation System (PIOMAS, Zhang and Rothrock, 2003) developed at Polar Science Center, Applied Physics Laboratory, University of Washington, and is displayed below interactively (hover over blue line to see the respective volume data for that year). As mentioned in the discussion, some ice may persist close to Greenland for a few years more, since Greenland constitutes a barrier that holds the sea ice in place. Similarly, it is suggested that natural variability could prolong the ice longer than expected. 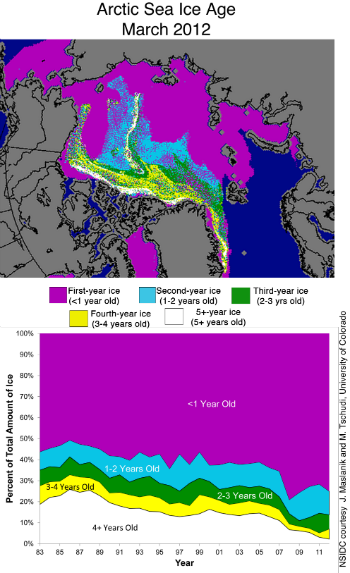 In fact, the thinner the sea ice gets, the more likely an early collapse is to occur. It is accepted science that global warming will increase the intensity of extreme weather events, so more heavy winds and more intense storms can be expected to increasingly break up the remaining ice in future, driving the smaller parts out of the Arctic Ocean more easily. Much of the sea ice loss already occurs due to sea ice moving along the edges of Greenland into the Atlantic Ocean. Discussion: Should patent law apply to geo-engineering? David Keith, a Harvard University professor and an adviser on energy to Microsoft founder Bill Gates, said he and his colleagues are researching whether the federal government could ban patents in the field of solar radiation, according to a report in Scientific American. Some of his colleagues last week traveled to Washington, D.C., where they discussed whether the U.S. Patent Office could ban patents on the technology, Keith said. "We think it's very dangerous for these solar radiation technologies, it's dangerous to have it be privatized," Keith said. "The core technologies need to be public domain." 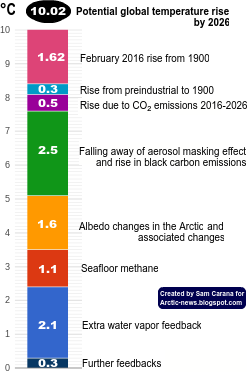 As suggested by Sam Carana, a declaration of emergency, as called for by the Arctic Methane Emergency Group (AMEG), could be another way to deal with this issue. A declaration of Emergency could give governments the power to overrule patents, where they stand in the way of fast-tracking geo-engineering projects proposed under emergency rules.Thus, patents don't need to be banned, prohibited or taken away; instead, patent will continue to apply in all situations other than the emergency situation, while new patents could also continue to be lodged during the emergency period. Even where patent are directly applicable to proposed projects, patent law would still continue to apply, the emergency rules would merely allow governments to proceed in specific situations, avoiding that projects are being held up by legal action, exorbitant prices or withholding of crucial information. A declaration of emergency could also speed up projects by removing the need to comply with all kinds of time-consuming bureaucratic procedures, such as the need to get formal approvals and permits from various departments, etc. This brings us to the need to comply with international protocols and agreements. If declared internationally, a declaration of emergency could overrule parts of such agreements where they pose unacceptable delays and cannot be resolved through diplomacy. The issue is also discussed at the Geoengineering group at Google. Seismologists say last week's powerful earthquake off western Indonesia increased pressure on the source of the devastating 2004 tsunami: a fault that could unleash another monster wave sometime in the next few decades, reports the San Francisco Chronicle. “The spring was pushed a little bit tighter,” said Kerry Sieh, director of the Earth Observatory of Singapore. In fact, two big quakes (8.6 and 8.2 on the Richter scale) rocked Indonesia; just hours later, three more earthquakes occurred in Mexico (7, 6.9 and 6.2 on the Richter scale). In just two days, 39 earthquakes rocked the planet, reports the Bucharest Herald. “Something is wrong! There are too many strong earthquakes,” believes Romania’s top seismologist, Gheorghe Marmureanu, who finds the latest Indonesian quake very unusual. According to Marmureanu, what happened in Indonesia came as a surprise that puzzled scientists. “Statistics show that, in this region of Asia, there is one big earthquake every 500 years, roughly. 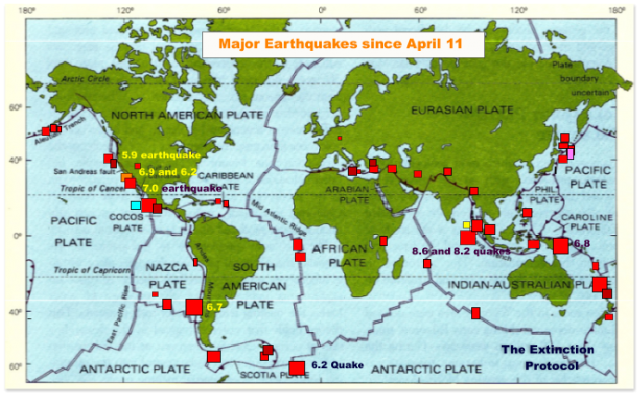 However, since 2004, there already were three quakes with magnitudes above 8, which is out of seismological statistics. Something is wrong! There are too many big quakes in the Indonesian area,” Marmureanu warns. 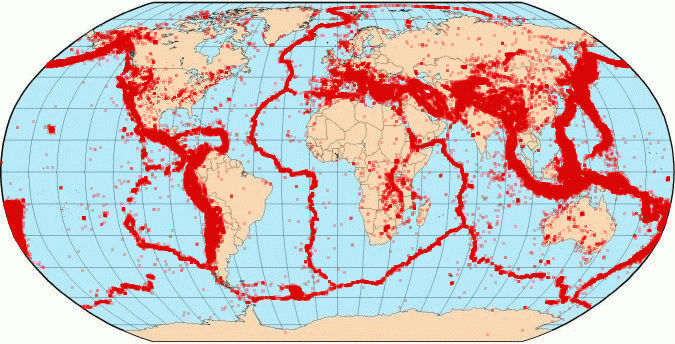 The post at the Extinction Protocol is accompanied by above map, with the caption that the shocking number of earthquakes that have rattled the globe, especially along tectonic plate boundaries, since the double 8.0+ magnitude earthquakes struck off the coast of Northern Sumatra on April 11 could be early indication the planet may be shifting towards a new catastrophic model. Apart from earthquakes, there has also been plenty of volcanic activity this year. On 13 April, an explosion from Sangay volcano was observed at 08:25 local time, generating an ash and steam column of 2 km above the summit crater. This was the 49th volcano to erupt in 2012, reports the Extinction Protocol in another post, adding that there were about 50 volcanoes eruptions in all of 2011, while from 1990 to 2008 the average number of volcanoes erupting annually was 66. The chart below, from dlinquist.com, shows a smoothed graph with total strength of earthquakes registering as 6+ on the Richter scale from 1973. Finally, the map below, also from dlinquist.com, shows where earthquakes have occurred from 1973. Importantly, earthquakes can disturb methane hydrates, resulting in abrupt releases of methane; as the post Thermal expansion of the Earth's crust necessitates geoengineering discusses, to firmly reduce this risk would necessitate geo-engineering. The East Siberian Arctic Shelf (ESAS) is home to the world’s largest hydrocarbon stocks, which consist of natural gas, coal bed methane (CH4), and shallow Arctic hydrates. Until recently, the ESAS was not considered a CH4 source due to the supposed impermeability of sub-sea permafrost, which was thought to completely isolate the CH4 beneath from modern biogeochemical cycles. 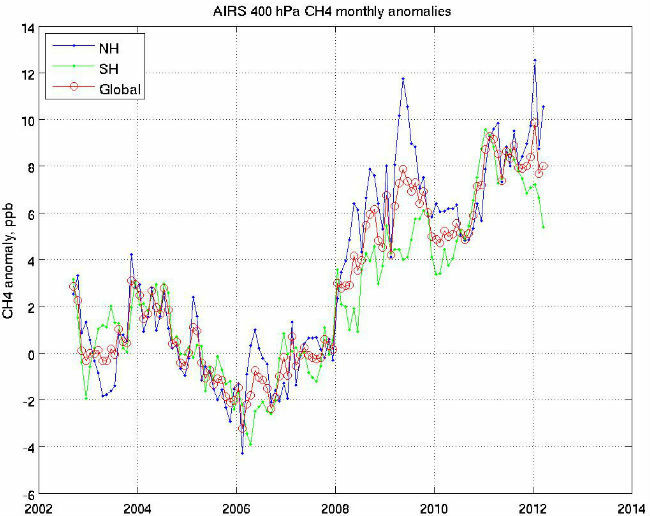 However, the ESAS represents an enormous potential CH4 source that could be responsive to ongoing global warming. Such response could occur in substantially shorter time than that of terrestrial Arctic ecosystems, because sub-sea permafrost has experienced long-lasting destabilization initiated by its inundation during the Holocene ocean transgression. ESAS permafrost stability and integrity is key to whether sequestered ancient carbon escapes as the potent greenhouse gas CH4. Recent data suggest the sub-sea permafrost is currently experiencing signiﬁcant changes in its thermal regime. For example, our recent data obtained in the ESAS during the drilling expedition of 2011 showed no frozen sediments at all within the 53 m long drilling core at water temperatures varying from -0.6˚C to -1.3˚C. Unfrozen sediments provide multiple potential CH4 migration pathways. We suggest that open taliks have formed beneath the areas underlain or inﬂuenced by the nearby occurrence of fault zones, under paleo-valleys, and beneath thaw lakes submerged several thousand years ago during the ocean transgression. Temporary gas migration pathways might occur subsequent to seismic and tectonic activity in an area, due to sediment settlement and subsidence; hydrates could destabilize due to development of thermokarst-related features or ice-scouring. 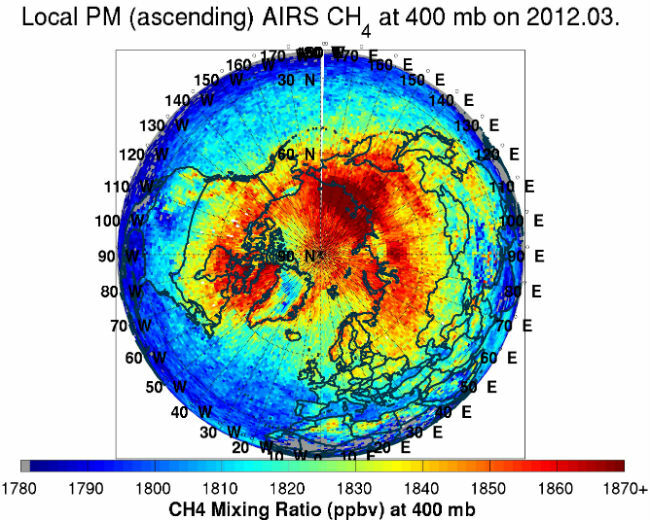 Recently obtained geophysical data identiﬁed numerous gas seeps, mostly above prominent reﬂectors, and the ubiquitous occurrence of shallow gas-charged sediments containing numerous gas chimneys, underscoring the likelihood that the ability of sub-sea permafrost to capture CH4 released from the seabed is failing. Available data suggest the ESAS sub-sea permafrost is currently leaking a substantial amount of CH4. We propose that a few different types of CH4 exist, and are becoming involved in the modern carbon cycle due to permafrost destabilization in the ESAS: modern biogenic CH4 produced from ancient substrate, relatively old biogenic CH4 mobilized from hydrate deposits, and old thermogenic CH4 accumulated within seabed deposits. Isotopic data obtained by sampling CH4 in the water column and atmospheric CH4 in close proximity to the sea surface conﬁrm the contribution from different sources, and demonstrate that the isotopic signature of CH4 from the ESAS can be used to create an interpretive plot for deﬁning hydrates. CH4 ﬂuxes could occur as numerous weak seeps, as large areas of strong bubble plumes, or as sites where CH4 releases are ﬂare- or torch-like and the emissions are non-gradual. Due to the shallow and oligotrophic nature of the ESAS, the majority of aqueous CH4 may avoid biological oxidation in the water column and escape to the atmosphere. 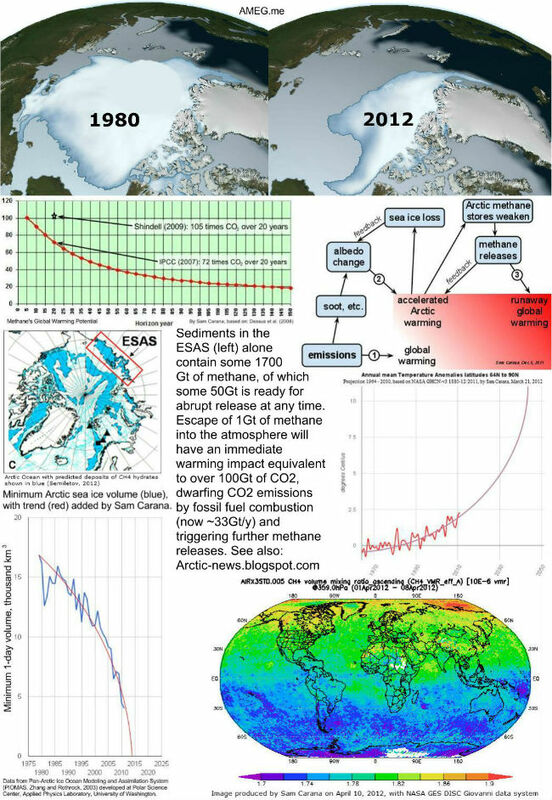 Further investigations should be focused on quantifying the total CH4 pool of the ESAS, improving our understanding of the mechanisms responsible for sub-sea permafrost destabilization and gas migration pathways formation, and decreasing uncertainties regarding the current CH4 emission mode and its future alteration by progressing permafrost degradation. by Igor Semiletov, et al. 2) drastic sea ice shrinkage causes increase in storm activities and deepening of the wind-wave-mixing layer down to depth ~50 m that enhance methane release from the water column to the atmosphere. 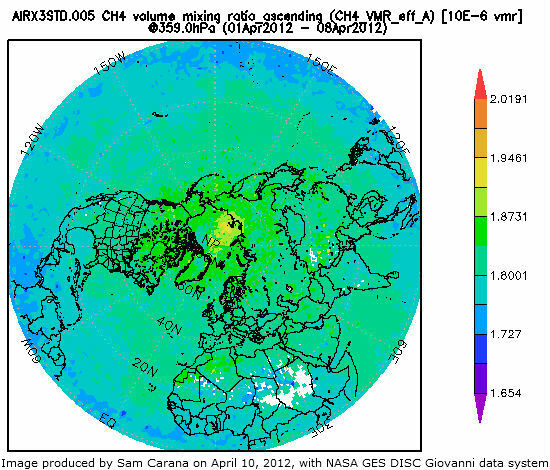 The National Snow and Ice Data Center (NSDIC) has released an update of its Arctic Sea Ice News & Analysis (April 4, 2012). Ice age data this year show that the ice cover remains much thinner than it was in the past, with a high proportion of first-year ice, which is thin and vulnerable to summer melt. After the record low minimum of 2007 the Arctic lost a significant amount of older, thicker ice, both from melting and from movement of ice out of the Arctic the following winter. In the last few years, the melt and export of old ice was less extreme than in 2007 and 2008, and multiyear ice started to regrow, with second and third-year ice increasing over the last three years. After the near-record melt last summer, second-year ice declined again, but some of the ice that had survived the previous few summers made it through another year, increasing the proportion of third- and fourth-year ice. 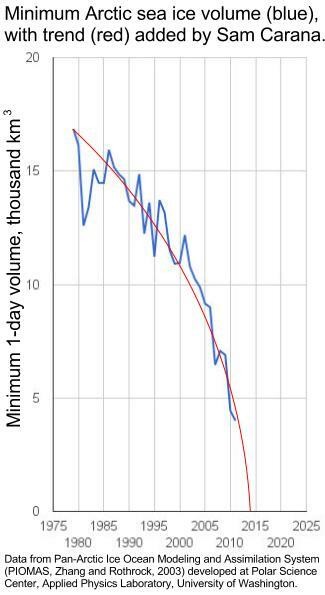 However the oldest, thickest ice, more than four years old, continued to decline. Ice older than four years used to make up about a quarter of the winter sea ice cover, but now constitutes only 2%. First-year ice (0 to 1 years old) this year makes up 75% of the total ice cover, the third highest at this time of year in the satellite record. 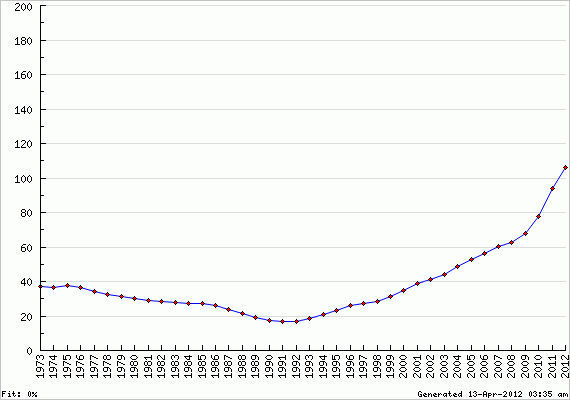 In 2008 the proportion of first-year ice was 79%, and in 2009 it was 76%. NSDIC also points at a study by Jennifer Francis of Rutgers University and Steve Vavrus of the University of Wisconsin that suggests that warming in the Arctic is causing weather patterns in mid-latitudes to become more persistent. This persistence can lead to conditions like heat waves, cold spells, drought, flooding, and heavy snows. The researchers found that as temperatures in the Arctic warm and become closer to temperatures in lower latitudes, the waves of the jet stream tend to spread out, and west-to-east winds slow down in the upper level of the atmosphere (where storm tracks form). Both of these effects tend to slow the progression of weather patterns, which means that a weather pattern, whether hot or cold, is more likely to stick around.